Well, I wrote about my passion for sewing, my love for salsa, my husband. Forgot to show you another significant other :)) Please meet my cat who, like all the cats of people who sew (or so I've read on many many blogs), loves to be around me everytime that I sew or cut fabric. She also tries to help by messing with my fabric or patterns. 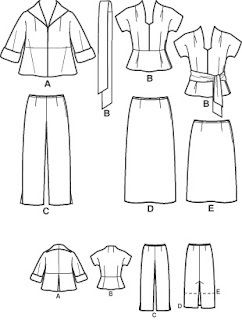 Sewing patterns, of course! This is my early Christmas gift for myself. Early is one way to put it, with shipping and everything, they will be here mid-January, I expect. So, the salsa weekend is over. And it was indeed great. Eddie is such a wonderful person, with so much energy (7 hours of teaching per day plus dancing non-stop in the evening! ), a great dancer, a wonderful teacher and a very feminine woman! Saw this blouse at Trashy Diva... And it is in red and black. Should I copy it for my SWAP? Done! My dark grey pants. I also made a label, embroidering my name on a piece of ribbon. I guess I must take other pictures, in daylight, but was too impatient. I was telling you that I won't be having a lot of time for sewing this month. Starting Wednesday, I am a trainer until Friday and this training takes place in a mountain resort, a 3-hours drive from Bucharest, where I live. But the most exciting thing in my life this week (besides the SWAP, of course!) is salsa. I've been dancing salsa for some years now. We try to go out every Friday and dance - it's the only exercise I get anyway. Well this weekend, the best salsa dancer of our times, Eddie the Salsafreak is coming and having a salsa bootcamp in Bucharest - this means 6 hours of workshops Saturday and another 6 hours on Sunday, plus a party every night. I am a bit terrified of that but still excited. I like Eddie very much and one of the reasons (besides her being a very energetic and positive person) is that she started dancing at 35 years old, abandoned her career (Java programmer) and now at 38, she is the best dancer in the world and living only from and for salsa. It is interesting, don't you think? I doubt I would have the gutts to leave my job (I'm almost 35) and live only from dancing!!! It's so nice. I posted this photo on my newly created flickr account on Sunday and it seems that my swap fellows really like my fabrics. This is motivating... I looked so much at them that they started to look completely plain to me. Just click on any pattern sketch to get a bigger picture. 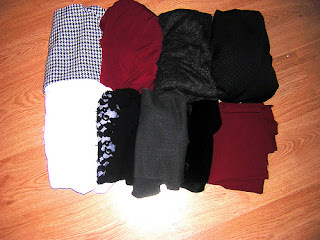 Plaid fabric (black/white/grey) - I want to make a jacket and a skirt. Already cut the jacket, using MJ3100 from e-sewingpatterns.com. I altered the pattern, lengthening it by 6 cm. Also gave up the Mao collar and drafted a lapel. I'll cut a collar after I sew the jacket and see how the lapel looks like and decide how big I want the collar to be. however, I'll just cut a "normal" yoke. Edited 5 January 2007: jacket and skirt DONE, I'll be posting photos this weekend. I would like to make this cross-over top from seeitsewit.com my reversible item, with a red side and a black side. I used my lunch break to go buy some stretch cotton (red and black), because I'm not sure I can find a double-sided zipper in my country. I've already made this top and I like it very much. 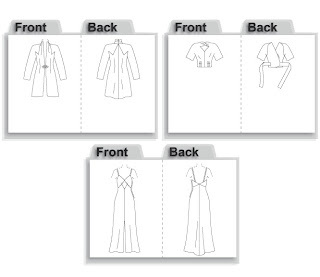 For this Swap, as it is an office wardrobe, I will alter the pattern to reduce a bit the cleavage. The top that I made I have to wear it with a bustier underneath if I want to wear it at work. 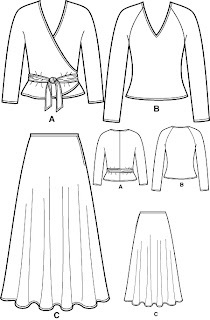 I'll make a long-sleeved top from the white cotton/lycra jersey. I'm planning a close-fitting top, with a round neck. Collar and cuffs from jersey with black lace overlay. I might also add a false button extension in black jersey (simulating a blouse, you see) and maybe sew some black buttons on it. I'll use an existing T-shirt pattern for that and alter it accordingly. Dark grey wool/poly - pants from a pattern I drafted myself, copying my favorite jeans. Already made this pattern and absolutely love it. 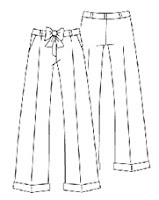 I sewed on the pants yesterday evening until midnight and with a bit of luck they will be ready tonight. Want to take advantage of the fact that my husband is abroad until Tuesday evening. December is such a busy month that these are my only sewing moments and I will probably restart working on the Swap after 10 January 2007. PANTS DONE! Jalie cross-over top (#2499) from red poly with black band. 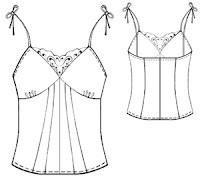 Jalie camisole (#2564) - shown here on the right. Haven't decided pn the fabric yet. Black wool/poly - Artful Dodger Slouchy Man Pants from Hot patterns. Never made this pattern before, so it is not tried and true. Hope it will work out however, my measurements seem to be pretty standard, even if I'm quite petite (1.58 m, I guess it's about 5' 2?) 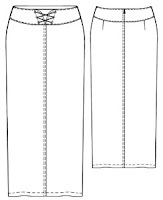 From the same black fabric, I will make a skirt inspired by the Hot Patterns bustle skirt - see it here. 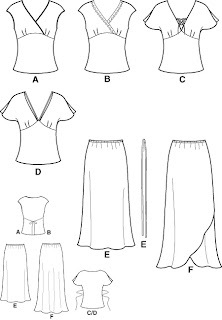 I have the perfect pattern to work on, one that I drafted from a too large RTW skirt. Black stretch velvet - cami from Modern Sewing patterns, with black lace. Seems I'm two tops/blouses short for the time being. I might make a white shirt but I still have to think about it. So this is my first blog. After many months of reading other people's blogs and "lurking" in their virtual sewing rooms, I'm starting this blog to show my progress on SWAP 2007 (for rules of "sewing with a plan" contest see http://www.timmelfabrics.com/2007swaprules.htm). Hmm... I'm feeling a bit shy so I'll say goodbye for now and hopefully let pictures speak for me sometimes soon.